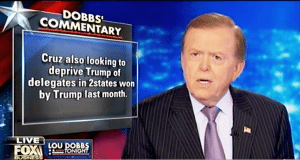 Lou Dobbs has a few thoughts and some comments on the state of the Republican Party, the presidential contest and the attempts by those in power as well as Ted Cruz to change the results and the rules that allow them to do so. 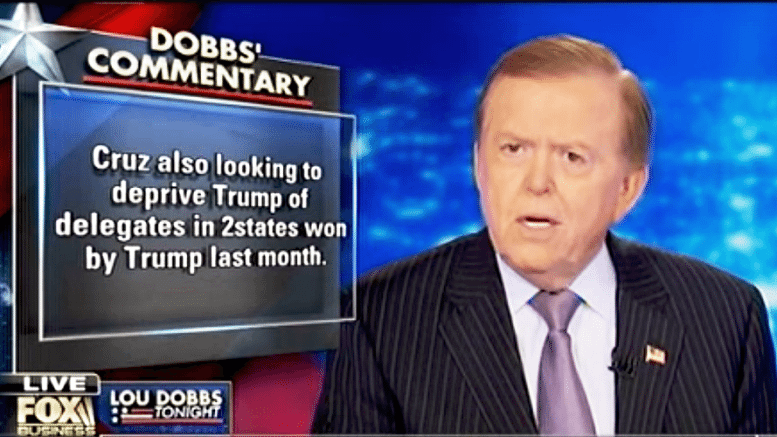 Dobbs points out that while there are 42 delegates up for grabs, in some ways quite literally, Cruz is already laying claim to 25 delegates that are free spirits from the state of North Dakota. The people have no say in that state, the establishment chooses for them. He also cites a Washington Examiner report that Cruz is already working to recruit delegates in Arizona, a state in which he was soundly defeated by Donald Trump. This is all based upon the hope of the Cruz-Kasich-anti-Trump establishment cadre of evil that is hijacking the will of the people to steal the election on the subsequent ballots following a failure to reach the necessary 1,237 for a first ballot victory. He continues, “But the RNC firing back today and you know, this is not going to surprise you one bit. They’re defending their process.” He plays a clip of Sean Spicer, the RNC Communications Director, who puts the responsibility on the campaigns. He said, “It’s the job of these campaigns, you go out and you win the delegates and then you get your person to run and what you want is to have them maintain a commitment of you for as long as possible, hopefully through all of the balloting. But that’s part of the process.” Clearly the Republican elites value their “process” more than the will of the American people. I’m Rick Wells – a constitutional conservative writer who recognizes that our nation, our Constitution and our traditions are under a full scale assault from multiple threats. I’m not PC; I call it like I see it. – “Like” him on Facebook, or “Follow” him on Twitter. – Please SUBSCRIBE in the right sidebar at http://RickWells.us or http://constitutionrising.com to receive our posts directly. Thank You – Rick Wells.